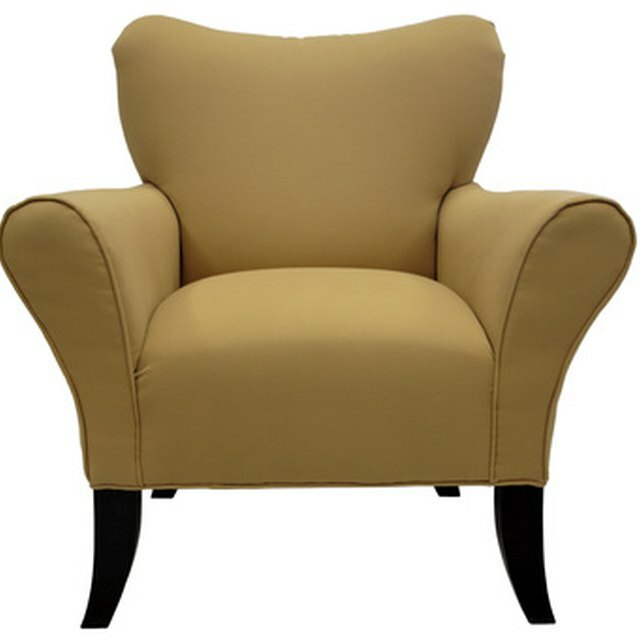 Reupholstering your oversized chair is the perfect way to give your room a little lift without spending a lot of money. Reupholstering it is usually a lot cheaper than having it done professionally or buying a new oversized chair. All you need is a few materials, patience and time and you're on your way to a newly designed oversized chair! Find the right materials. To reupholster an oversized chair, you will need plenty of upholstery fabric, measuring tape, a staple gun and staples, batting, and pliers. The amount of upholstery fabric depends on the size of your oversized chair. Most fabric stores like Hancock's or JoAnn's have a guide showing you the amount of fabric you may need. It's always smart to buy a little more than what you need in case you cut too much off or make a mistake. You can always find uses for the leftover material if there is any. Strip the fabric from the chair. Be careful when doing this so you do not rip the old fabric. If your oversized chair has cushions on it, you're in luck because you can just sew the new fabric right over the old fabric. Make sure you take out the old staples and tacks and leave the wood frame clean. Lay the old fabric out on the new fabric and cut around it leaving plenty of room to use for stapling. You can either mark on the pieces with fabric marker or leave them pinned to the old pieces to identify them. Repair any holes in the foam of the cushion. If the cushion is damaged, completely replace the foam for best results. Staple the batting down around underneath the cushion to hold it in place. Lay the new fabric down on the chair. When stapling the fabric to the wooden frame, make sure you pull the fabric nice and tight. Also, be sure not to pull too hard or the fabric will rip. Apply the fabric in the opposite direction that you took it off. If you started with the back, then end with the back. If the metal strips you've uncovered are still usable you can put them back where they were. If they are not usable, simply cutting a piece of cardboard the same size; using those strips is just as easy. To avoid holes made from stapling the batting, try stapling the batting and then pulling the batting around the staples. If you are trying to prevent imperfections, do not take any shortcuts. If you can live with minor imperfections, you can always blind-stitch areas. You can also find nice trimming at upholstery shops to place around the edge of your oversized chair to give it some flair!